An audience with Jeff Goldblum is not like other interviews. For a start, there’s his innate Jeff Goldbluminess, an easy charm and earnest enthusiasm that’s impossible not to warm to. He’s possessed of a puppyish sense of curiosity, chasing his own thoughts off on tangents, occasionally taking off his glasses and staring into the distance. He deflects questions back, and often ends answers with an inquisitive “What do you think of that?” or “How does that sound?” Think less Hollywood A-lister, more wise old sage. Then there’s his self-effacing, “aw, shucks” humbleness, a genuine gratitude that anyone cares about his foray into jazz (“Thank you so much for doing this,” he says after we speak. “It’s been so nice.”). He apologizes profusely for eating lunch during the interview and despite being tired and on a tight schedule, is unfailingly polite and gracious. 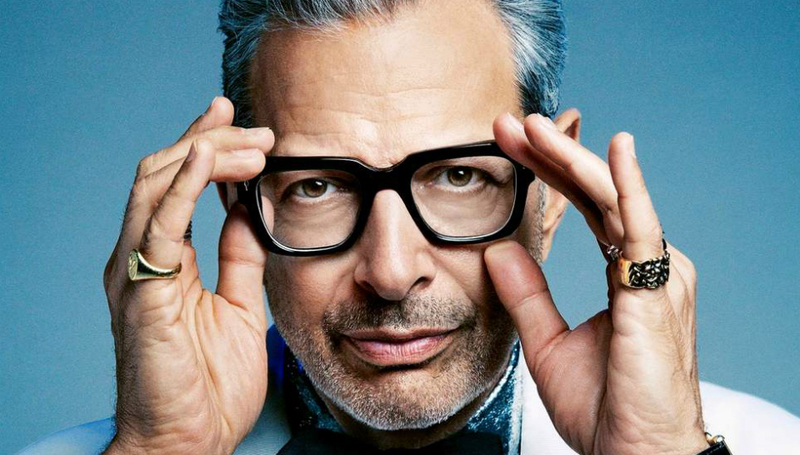 Above all, you’re left with the sense that he’s not playing a role or curating a public persona – the real Jeff Goldblum is exactly how you imagine him to be, a man constantly amazed and inspired by the fact that he gets to be Jeff Goldblum. We meet at the Corinthia Hotel, a monied, discreet establishment just off Whitehall; the lobby is dominated by a magnificent Steinway that, sadly, he doesn’t have time to play. He’s in London for one last round of promotion for The Capital Studios Sessions and a doubleheader at Ronnie Scott’s, part of the EFG London Jazz Festival and the last leg of a short, European tour. Paris and Berlin were also on the schedule, as well as the opening show at Cadogan Hall one week ago - “just a little jaunt,” he says. In true Jeff Goldblum style, he flew in this morning on EasyJet; no entourage, no airs and graces, just a custom Prada shirt and that million-watt smile. Of course he posed for a picture with the cabin crew. By now you’re no doubt familiar with the story of how the young Jeff Goldblum fell in love with jazz. If you’re not, in short; he grew up in Pittsburgh with his radio worker mother, doctor father, three siblings, and a Steinway grand piano. At his parents’ insistence, he took lessons, which he initially hated. The turning point came when he heard one song – ‘Alley Cat’ – and resolved to learn it. From there he moved on to chord sheets for songs from the Great American Songbook, taking inspiration from the city’s own piano jazz star, Erroll Garner, and by 14 was cheekily phoning round local bars, saying he’d heard they were looking for a pianist. He got several gigs. But why jazz? “It’s just mysterious,” he says. “When I was a kid, something in my bones was already a little like [rocks shoulders rhythmically, almost slinkily], you know? I just had that. That doesn’t mean I would have necessarily inevitably done anything with it of course, but I took piano.” He confesses to being “undisciplined” when it came to tutelage, but he had “a little facility for it – I was getting through my lessons.” More alluring were the records his dad and older brother would bring home; Erroll Garner Plays Misty, Sketches Of Spain, Stan Getz, and Astrud Gilberto. Then came ‘Alley Cat’ and he was hooked. “I just liked it, and that was that; I was off and running,” he says. He’s been playing almost daily ever since. Despite this passion, he never wanted to make a career of it. “I was dead set on being an actor, but I just loved playing,” he says. “I kept it around when I was in New York, and then put it in some movies and plays; snuck little bits of it in here and there. Then thirty years ago I started to play out and about.” He’s had a Wednesday night residency at LA’s Rockwell Club for the last seven years or so, but it was an appearance on The Graham Norton Show last October, when he played with Gregory Porter, that brought his musicianship to the wider British public. One of those watching was Decca’s head of A&R, Tom Lewis. Duly impressed, he flew to LA, watched a show, and signed him for an album. Lewis put Goldblum together with Larry Klein, the Grammy-winning producer, who in turn brought Till Brönner, Imelda May, and Hayley Reinhart on board. To recreate the free-flowing fun and laid-back lounge vibe of his Rockwell shows, a decision was made to recreate the club at the legendary Capitol Studios and record live in front of an audience; the result is a blast, like listening in to Golden Age Hollywood cabaret in someone’s living room. Jazz, especially in the UK, is enjoying something of a renaissance – the New British Invasion said Rolling Stone back in March. A colleague of mine recently asserted that the “punk rock spirit isn’t dead, it just entered the host body of jazz”, and listening to the fervent politics and innovation of Sons Of Kemet, or Kamasi Washington’s sprawling, concept-heavy musical arcs, it’s hard to disagree. Even cult indie heroes are dabbling, while a new generation of jazz maestros – the likes of Ryan Porter, Marike van Dijk, and Makaya McCraven – are pushing boundaries and re-shaping what modern jazz can be. A show by Jeff Goldblum is not like other shows. For a start, he’s his own warm-up man. As we take our seats at Ronnie Scott’s, thirty minutes before he’s due on, Goldblum is already prowling between tables with a microphone, amusing and delighting the growing crowd. Part comedy, part light entertainment, he works the room like an expert, dropping witty bon mots and telling anecdotes. Just before showtime he casually says that if anyone wants a photo, just come on up; a queue quickly forms, and he poses for the last few seated at his piano after the band have already started playing. The shows may be a “let the chips fall where they may” event, as he puts it, but musically he and the band – the Mildred Snitzer Orchestra – are astoundingly good. He claims to not know the setlist in advance – “I don’t know what we’re going to play; I’m surprised to see if I can recognise their varied and sometimes tricky version of something” – but it doesn’t show; everything is razor sharp and tight, and flows beautifully. Goldblum isn’t really a soloist or virtuoso, but he really can play. He can sing too – on the record, his duet with Silverman is polished and sassy – although sadly, we don’t get much of that tonight. At the end of the show, there’s a seemingly never-ending line of people wanting to shake his hand, say a few words, or snap one more selfie. With the patience of a saint, he greets them all, posing, chatting, and generally just being the best Jeff Goldblum he can be. No one leaves disappointed. Jeff Goldblum the jazz player. What do you think about that? The Capitol Studio Sessions is out now via Decca Records. For more information about Jeff Goldblum and his jazz odyssey, please click here.